Line a large baking sheet with parchment paper, unroll crescent dough onto it. Set aside. In a large saucepan, bring maple syrup to a boil, cooking until it reaches the hard ball stage (about 265°F on a candy thermometer). Stir in bacon bits and drizzle over crescent dough, using a spatula to completely cover the dough with the maple mixture. 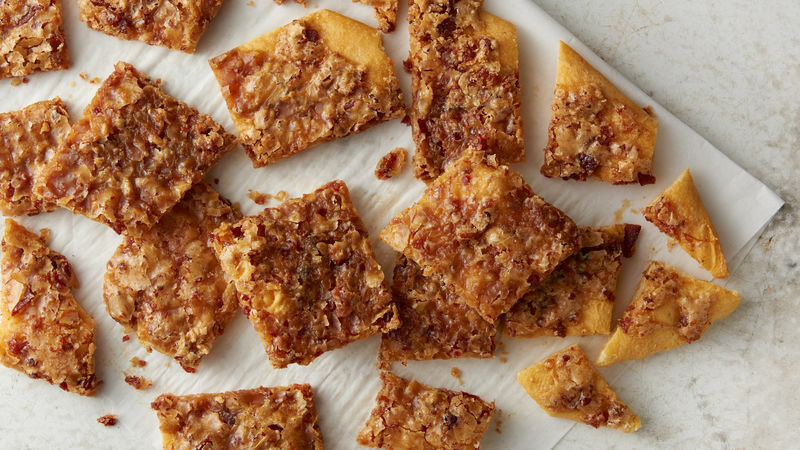 Bacon crack is one of the most addictive sweet-and-salty snacks we’ve ever had. With pure maple syrup and bacon bits, you get that sweet-and-salty flavor you crave, and with a crescent roll base, you can cut and conquer this snack like never before. While you could use packaged bacon bits, you can’t beat the flavor from cooked bacon. You can change the flavor of this recipe by experimenting with the different types and flavors of bacon you choose. If the idea of cooking bacon over the stove feels like too much work for a quick, three-ingredient snack, did you know you can bake bacon in the oven?